Bobby Valentine’s first season as Red Sox manager has been marred by an apparent lack of respect from players. Editor’s note: Christopher L. Gasper debuts today as a full-time sports columnist. He is a talented and knowledgeable young man who is Boston through-and-through and a graduate of Boston University. He is also hosting Boston Sports Live on boston.com Mondays, Wednesdays, and Thursdays. It’s over. End the charade now. 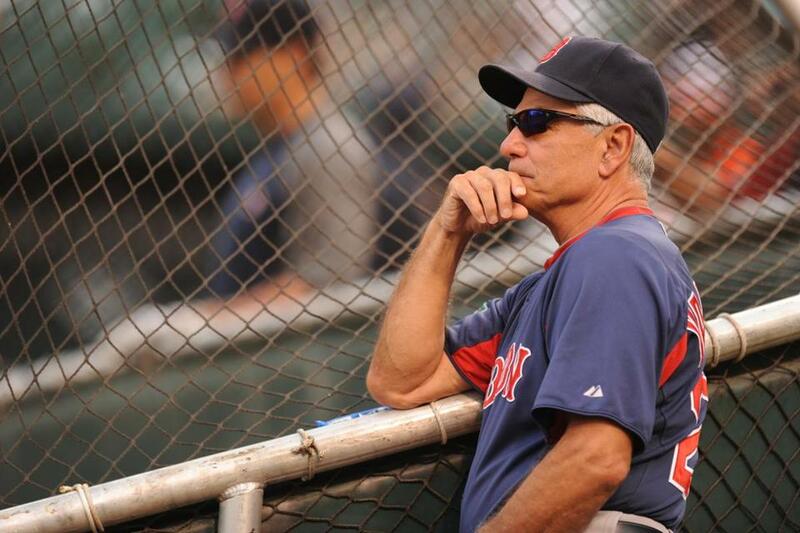 The Red Sox have to remove Bobby Valentine as manager, for his own dignity, as well as the team’s. Mutiny on the Bobby is the last straw. Valentine doesn’t deserve to be fired. He has done an admirable job in the face of impossible circumstances and myriad injuries. But the bottom-line evaluation of a manager is whether he is capable of getting the most out of his players. Valentine will never do that here, not as long as those players are empowered to go behind his back and complain about him to ownership, publicly challenge him in the media and have the general manager side with them, and otherwise belittle him with impunity. This failure of a season is not on Valentine, who walked into a minefield of dysfunction and disaffection at Fenway. He made his missteps with Kevin Youkilis and Will Middlebrooks, certainly, but he could have been the best communicator since Winston Churchill and it wouldn’t have mattered to players who never wanted him. This debacle is on ownership, upper management, and baseball operations, who all refused to give this team a personnel makeover or a personality one, and most of all it’s on some Sox players, the ones who are snickering at Valentine now, the ones who never gave him or his way a chance, the ones who have behaved as unprofessionally behind the scenes this season as a few did last September. Just when you thought this Red Sox team couldn’t get any more disagreeable or disappointing, it has. According to a Yahoo! Sports report, a group of Red Sox players, including Dustin Pedroia and Adrian Gonzalez, met with ownership in New York July 26 to express their distaste for Valentine and his managerial methods. They imparted that they were done playing for Bobby V.
Discuss: Should the Red Sox fire Valentine? The meeting was called, according to the report, after Gonzalez sent a text message to ownership on behalf of a group of disgruntled players who were upset that Valentine left lefthander Jon Lester in against the Toronto Blue Jays to surrender a career-high 11 earned runs and a career-high four home runs in a 15-7 loss at Fenway July 22. Lester had already surrendered nine runs when Valentine sent him out for the fifth inning. Lester promptly walked the first batter and then served up a two-run homer before heading to the showers. I guess the Red Sox rebels without a clue forgot that Valentine had used six pitchers the night before in a 7-3 loss to the Jays. But sparing Lester’s feelings, not the arms of his overworked bullpen heading into a six-game road trip, should have been his priority. Even if Lester’s ego was bruised, he has pitched some of his best ball in the four starts since then, including striking out a season-high 12 in a win over Cleveland Sunday, so the experience couldn’t have been too traumatic. The guy who comes off looking the worst in this story is Pedroia. Everybody loves Pedey. He is witty, engaging, honest, industrious. He plays every game as if it’s his last. You would be proud if your son played the game like Pedroia. He went on the radio after last September and offered a heartfelt pledge to Red Sox fans that the team would do better. He has always been one of the good guys. Now, he’s at the heart of an alleged insurrection. As this team stumbled through the season, it became clear that either the other players weren’t following Pedroia’s lead in terms of moving on from the Youkilis-Bobby V dust-up, or he was subverting the manager behind the scenes. This story says it’s the latter. According to the Yahoo! report, it was two days after the confab with ownership in which Gonzalez and Pedroia were vocal about their dislike for Valentine that former Red Sox manager Terry Francona held his fireside chat with Pedroia and a few Sox players and coaches in the clubhouse at Yankee Stadium. In that context, it certainly looks like Pedroia was doing more than catching up with his old cribbage partner. He was making a statement. Whether or not the photo is real or digitally altered, it is a picture of the blatant disrespect some members of the team have for their manager, led by Pedroia. Maybe if some of the Red Sox “leaders” had been as upset with their own teammates last year — the ones whose behavior got Francona fired — and complained to ownership about it, Tito would still be here, and Valentine wouldn’t. Try a mirror, fellas. Those votes of confidence in Bobby V from owner John Henry and general manager Ben Cherington are meaningless now. How can you back Valentine publicly when you privately invited players to bad-mouth him? The Sox are being delusional if they think they can clasp the life preserver of the second wild card now without changing the clubhouse culture or the manager. We know which one is easier to alter with 45 games left. Some would argue that relieving Valentine of his duties is letting the players win. It probably is, but the outcome of that matchup was determined long ago. Taking this meeting last month only confirmed it. There is no need for Valentine to play out the season as Captain Queeg in his own clubhouse. Hopefully, removing Valentine will force the Red Sox to face the truth. The problem last September wasn’t the manager. The problem this season isn’t the manager. Christopher L. Gasper is a Globe columnist. He can be reached at cgasper@globe.com. Follow him on Twitter @cgasper.